Bank Holiday Monday or not, this grim task still has to be done. Well, with snow on the ground outside, it’s not as if I can take out my mood on some spring work in the garden. May as well just plough through it. Ready? Here goes. Locals: Mayo Advertiser, Connaught Telegraph. Others: GAA, RTÉ, BBC, The 42, Breaking News, Hogan Stand. Hurlers: Mayo Advertiser, Connaught Telegraph, Irish Examiner, Irish Independent, GAA, The 42. Speaking of the hurlers, my next job – after the breakfast, mind – will be to put up a bonus piece, another guest one from Adrian Hession, about yesterday’s NHL Division 2B final exploits at Breffni Park. Stay tuned for that, as well as the latest edition of the Mayo News football podcast which will be online at some stage later on today. Any word on Keegan yet? Big hit. Thing that sticks out is that no Mayo player squared up to McNulty afterwards. Same with the clatter Regan got against Kerry. Something not right there at all. need to go heavily defensive next week and stop goals going in and build from there. Surely it’s time to freshen up the management team?!! Jim Gavin is doing it regularly and going outside GAA to bring in new ideas to his squad. I’m not the only one that’s been calling out for a forward coach over the past couple of years. And surely there must be a few club players that could be tried out at full back? If McBrearty is still missing next Sunday then perhaps Aidan would be given the job of looking after Michael Murphy? Or at least give the job to Donie Vaughan if he’s match-fit. Let’s try something new on Sunday which is essential if we’re to stay in Division 1. And, please, please stop trying to fool the fans by publishing fake teams a day before the game. Our opponents won’t be paying any attention to what team is named so why are we the only county continuing this masquerade? Still, I’m hoping if we play with the spirit I know we’re capable of, we can come up with another miracle!!! C’mon Mayo!!! Wonderful the witch hunt has well and truly started. Deegan gave Andy a black card for talking back to an official. He can hardly go back now and say he meant to give him a red for physical interface?! I see some posters have said that Mayo looked heavy legged yesterday, ie, must be doing fierce hard training last week. Surely this is a management error, wrecking the players knowing that they had a fight for survival game at the weekend. Maybe alot of the hard work should have been left for April?. A few posters are looking for Shaughnessy from Claremorris to be on the panel, this guy is only about 5 feet 7 or so, even smaller than me. Km..Hill 16 Army and indo make a wonderful couple..for the gutter..My blood pressure dictated that I ceased reading both circa 2016.. I would be worried if I was Andy Moran, forgetting about who he is and where he is from but the GAA have been severe in anyone interfering with officials, Gordon Kelly from Clare just got 12 week for squirting water at an umpire just to illustrate my point. Yep and journalists look to all forums ,social media pages etc for info . Andy didn’t do fook all to deegan, his momentum brought him in close . Andy is playing county football since 2004ish and has always been of excellent conduct on and off the field , he is a role model county footballer . A superstar poty without any bad behaviour , his attitude is always complimented by his good nature . A true legend of the game. Even opposing fans find it hard to dislike him with the exception of roscommons boo boy section. Stop referring to hill 16 army…a disgraceful hate page. Agree sean he lost the cool got the card and apoligised and walked off. Infairness the foul was a silly call by deegan he fustrates the shite out of players and supporters everytime he refs. Hes to slow with the whistle and then when he does blow he holds up the play to long. He also thinks every player is out to fool him thats why he gets so many calls wrong. I agree With Sean McHale 100% we badly need to bring in a forwards coach and as regards to the full back position the mind boggles as to why a change isn’t forthcoming and that is not meant as a personal insult to the present incumbent but we he is not performing well and we need to be ruthless if we are to stay in division and have any chance of winning a Connaught title this year. Andy will be fine, it was a black card nothing else, and a harsh one at that. Time to give up/ignore reading whats on dub blogs, irish indo, herald and similar dung heaps. Mayo will recover, we’ve had worse days, and we’ll do the buisness in Ballybofey. Horrific & dangerous assault on Lee Keegan yesterday. Cannot understand the near silent reaction to this incident. Makes you wonder about the culture in the Tyrone camp & the GAA when this seems like an acceptable form of play. Let’s see if the punishment will reflect the GAA’s commitment to protect players. As always I hope you don’t mind me commenting but anyone who reads some of those sites threads are only frustrating themselves. I don’t even bother as this is the only site I ever comment on and read. I do realise that there are good and bad in every County but one thing I ‘ll never forget is coming back from a Leinster Final a few years back that we won and going in to a Pub for a pint on the way home. The pub won’t be mentioned but it was full of people wearing Dubs jerseys and when most of them seen me walking in with the match programme they asked me who won!! We played at 2 o clock that day as the Munster Hurling Final was on at 4 in Thurles so the people in the pub said they watched the Man Utd match on Sky and not the Dubs. Happens everywhere Im sure folks but I will never forget that. The hit on Lee was so bad. I am fearful for him. So unfair after all the work he put into get back after his two operations. Have to get behind the team for Sunday. Everytime Mayo have a poor performance there are calls for a forwards coach, we already have a coach in Buckley, one of the top coaches in the country, what is another forwards coach going to do, teach a bunch of 20somethings how to kick a ball, I just waiting for the post demanding a certain blonde bombshell be drafted into the setup ASAP. Mayo were poor yesterday but they have been poor for every league for the past 7years. But you know who else is poor, Donegal! They are shocking even with the likes of Murphy and McBrerrity. Its not a McGuinness team we are playing, Mayo are well able to get a result next week. On the fullback issue, players have been tried, for example Ger McDonagh. Sone people think he hasnt been given a chance but if he was doing it in training, outshining caff in training then he would be starting, but he isnt which suggests that he isnt good enough or at least not at the required standard yet. Personnally I have no worries about our defence beacuse we have Harrison, Barrett, Vaughan, Higgins to come back. Durcan is just back from injury, ODonaghue looks to be a solid player who will only get better. Come championship our defence will be unrecognizable to the one lined out yesterday. I have been a long time of the opinion that the the five players that really make this team tick are Higgins, Boyle , Vaughan , Keegan & AOS . Not individually but the sum of the parts . And with only AOS & Boyle now the only two looking to certainly there on May 13 we really have to face up to the possibility of another Qualifying campaign. We have a long year ahead of us guys , . Keep the faith . At the end of yesterday’s game in salthill when galway were pushing for a score the cynical mauling was goin on. There were 2 dublin players on the ground wrestling with 2 galway forwards on the stand side. The ball was over on the other side of the pitch. They took that stand side of the pitch out of play. Jim Gavin was positioned on the sidine stand side between where the 2 mauls were taking place but I don’t think he even looked at either rumble. It was planned and timed. ..Jason sherlock shouldered a galway player when going in to intervene in a player on player clinch. Not too much in it but did give him a little shoulder. ..Another incident of grappling on the ground and Philly made a run over to where it was going on, launched himself in to mid air and landed on top of the players who were on the ground. You wouldn’t see it in a wrestling match. ..For much of the game when we’ll say Dublin had the ball Galway had 1 forward and 14 players not further forward than their own 45 to 50 yard area. Same thing with Dublin when Galway had the ball. ..Both teams seem to be putting a lot of work in to this deep blanket defending Galway more so. This is what we’ll be facing in May. Galway started training in November, Mayo in January. Bad day at the office yday but it will be forgotten if we beat donegal. We’ve taken heavy defeats in the league before. I’d be far more worried about the extent of the injuries to keegan and cillian. Donegal have conceded 19 points per game in this year league they are no longer the side that are hard to score against. McBrearty will be ruled out of this game with a knee injury and without him Donegal only manage 13 points in their last two games. I’m expecting Mayo to win next Sunday as they have already beaten Monaghan away who are a better side than Donegal. Many have news but won’t post it because of house rules. Am sure official word will be out soon hopefully. Is it good or bad news ? Thanks, Sinead. When word gets out officially on the injury situation everyone will know soon enough. Mayo well beaten time to look forward to next Sunday was it windy in castlebar yesterday. Made no difference really as mayo didn’t have many shots! Hard not to, it was like a beach. One thing if our lads were used to it like this but it was new to them as well as Tyrone. Some home advantage playing on an unrecognisable surface. Bad day at the office yesterday.. All we can do is move on to Sunday now .. Hopefully higgins will be back and the injuries are not too bad.. Hon Mayo #keepthefaith ?? The man beside me made the comment that they looked like lads that were on the beer for Paddys and the more I think about it the more I’m wondering was he right !!?? The amount of handling errors we made, with a dry ball, was beyond belief. And tyrones best player Donnelly was left more or less unmarked for most of the first half and punished us every time he got the ball .. like was any of the management team looking at what was going on . Also the pitch looked dangerous with all the sand … every time any of the players fell they got up holding their shoulders usually. Some people have suggested forwards coaching and so on. For the first seven or eight minutes yesterday, we ran through Tyrone and I said to myself, Jesus Tyrone look very vulnerable here. On one of the runs, if I remember, Parsons was going right through, and the options were: goal, point, or pull down. He looked back for some one to off load to and eventually Tyrone got numbers back. This happened a few times until Tyrone, began to play tidy football and pick off points. What if we got a couple of goals in the early stages. It seems to take us a long time to figure out a team – sometimes two games. We should be much more ruthless in the early stages. That wouldn’t make any difference Norris. If Donegal beat us they have us on the head to head. Points difference doesn’t come into it. Norris, pts diff means nothing if is only two teams on the same number of points, I believe its the head to head result that matters which would be the case if Donegal manages a win. We won’t play a more important game this yea than our match in donegal. The transition to younger players will begin next season. We cannot continue to rely on the 32/33 year olds any more to be our backbone. This league has been disgraceful. Beaten off the park in all our home games and by our biggest rivals. Including FBD our record is not pretty P11 W3 D1 L7!!!!! All we are getting are excuses about injuries, final hangovers, travel. All teams have issues. We should have our mouths shut and just knuckle down. Division 2 may end up in a year in division 3 or years of failing to get promoted. Finances suffer and momentum is lost. We’re technically in the virtually the same boat regardless some of the results yesterday.. Had Donegal won,.. We would still need to win.. Had Donegal won and we won we still wouldn’t be sure, unless we beat Donegal next Sunday… What would have worked yesterday,.. Believe it or not, would be for both teams to play a draw, with Donegal loosing yesterday as it happened,.. Both ourselves and Tyrone would be safe…. Looks very likely Leroy will be out…. Which Mayo will turn up on Sunday? … Dr Jeckle or Mr Hyde… Last time Leroy had to miss an important match, Mr Hyde Mayo (especially as this massacre was inflicted on the Rossi) turned up.. Unrecognisable from their previous incarnation just a week previously….Hope is not lost! Now is the time this group need us more than ever . Sure Tyrone game was a disaster but I’m not going to start giving out about individual players or management . More annoyed by all the so called ‘ fans ‘ that left early !!! We get distracted so easily by the Andy affair. What will be will be, we have other concerns. Spillane’s criticism difficult to argue against. Not one save in 70+ minutes for Tyrone keeper. Not one constructive passing movement that looked likely to carve out a goal chance. Remember too Galway play a northern style defensive game and we have not come up with the plan to counteract it. 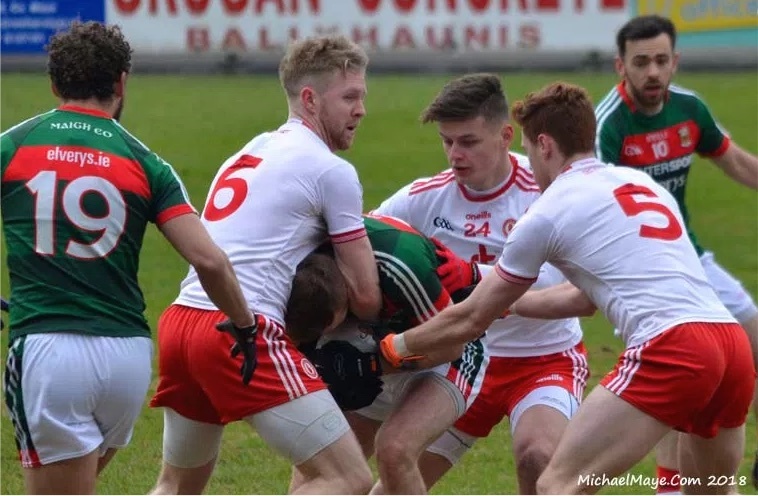 McHale park was bad yesterday & Tyrone played very good football on the sand patches all over the pitch yet Mayo could not hold on to the ball on several occasions. Now that’s Tyrone-Dublin-Kerry & Galway that has bullied Mayo in the league so far, if that’s some master plan the Mayo coaches are dreaming up, well it’s time to wake up for sure.Due to injuries, They have to play the young guns now which is a good thing, This Mayo team needs a shake up.The so called regulars think they can play when they feel like it, S R has big calls to make now, good luck to him & whatever team he can field next Sunday. I’ve been unavoidably away this weekend and missed the game. One of few I’ve missed in 48 years since I first started roaring for the red and green beside my father in 1969. He passed the baton on to me as did I to my daughters. But arriving back home today I rambled into my local shop and was absolutely disgusted to see the picture that the Western People chose with which to embellish their coverage of yesterday’s fiasco. I’m posting this without having read any other post by the way. I’m simply incensed to find a picture of Andy in a moment of crisis. Andy , a man who has given more to our cause than any other player. Living or dead. The WP has been described in the past as an organ which lives and breathes on the oxygen of Gaelic football. News is news but, editorially the Ballina paper has, in my opinion erred greviously and been less than kind to one to whom we owe so much. Nobody I know buys the Western People anymore it used to be a must read every Tuesday until they made it smaller and then published it on a Monday it’s not even printed in Ballina anymore it’s printed in Cork. Anyway for sports coverage and everything else it’s hard to beat the Mayo News it’s my first port of call for everything Mayo GAA after this blog. No point in blaming Rochford for the lack of young talent coming through, this is a County Board problem. How many club coaches are employed by Mayo Co board to help / oversee the coaching in the clubs?. I attended the U21 semi final in Tuam last March, Galway destroyed Mayo that day, Mayo were way behind physically. Alot of Mayo players including Akram didn’t have the power to break through the tackles. But the worst thing of all that day was when the big Galway midfielder had Akram by the neck, not ONE Mayo player came to his rescue, Cooke deserved a clatter, the game was over by then. A client of mine from Co Meath told me that his last visit to Croke Park was a number of years ago, Ciaran Whelan busted the Meath midfielder, I think it was Moyles, he knew Meath football was fucked that day. You claim that no one you know buys the Western People. That may well be so. There are, however, 50,000 people whom you obviously don’t you don’t know who do buy this paper each week. It is the largest selling provincial newspaper in the north-west of Ireland. That doesn’t mean it’s any good. Source of the robe sure people have to light the fire with something ? The focus needs to switch to Rochford a little. He is responsible for the performances. It appears that many Mayo fans are now equating yesterday to the Longford performance in 2010. My gripe with Rochford is the sheer conservatism in his selections. Caff has played every minute of the league despite his unconvincing form. Why hasn’t someone else being tried? Why has Nally only played 3 minutes since the Monaghan game? Why, for jaysus sake, has Loftus not started a single league game? Does anyone know the story re McHugh, MacNiallas and McBrearty’s availability on Sunday? I’ve read all the comments now since yesterday’s game. Frankly, would commenters please stop being so negative and melodramatic? Yes, yesterday’s result and game was woeful. The main problem was that we got swallowed up in the blanket, and Tyrone came with determination and planning, wanting a result and wanting to show they’re not the team steamrolled in last year’s AI semi-final. As Catcol mentioned earlier, we really need to try to score early, preferably with a goal (Diarmuid for this) and let the blanket conjurers then come out to play. We do wait too long to get ahead in games. I liken teams who lead with blanket defences to spiders. They wish to get you stuck in their web and then you cannot get out. Mayo were not allowed to play yesterday. They showed they could play well in Newbridge – regardless of the opposition – but the key is they were allowed the freedom there. There are quality players on this team – they have not disappeared over the course of any early season. Mayo are far from finished. If we get that far, watch how we’re playing at the end of July. I do worry for 13th May but then I do not believe this team is going anywhere but forward after that. I must admit I am shocked at the negativity and lack of belief displayed by the majority of posters on this blog today. I can understand feeling sickened – I felt that way myself. The reason I felt like that is that we are better than how things appeared yesterday, and we care about this team. But let’s have some perspective – this is the same team that beat Kerry last August and this is the same team that gave the best team of all time a run for their money in September. In addition, I believe we are still “hungover” since September (a second year through the backdoor -> injuries, psychological tiredness, in cases, perhaps, allied to people based in Dublin …) but in Newbridge new shoots showed signs of appearing. I believe we’ll meet an exact replica of yesterday’s opposition on 13th May. Wouldn’t it be brilliant if we could give a good rattle at the blanket then? Get ahead early and bring them out of their shell. I still believe in this team, and in this management. And by the way, who said we couldn’t beat Donegal next weekend? They have only 2 points. I suppose they’ll have to ‘come out to play too’ or will they hide behind a blanket? By the way, thank you Gamechanger10 for your warm and kind comments yesterday. Let’s assume that Lee and Cillian will be unavailable next weekend. Whats the strongest formation Mayo can put out against Donegal ?? There are posters on here pretty good at picking our best team. Can 1 or 2 of yea put up yer teams and start building a bit of courage before our trip to Ballybofey next weekend. We should remember that Tyrone had one extra day to prepare for this game, as they played last Saturday evening. Given the fitness advantage they have already, even little things like that can make a bit of a difference too. We are missing a lot of players at the moment as well. Our forwards got space against Kildare and we did damage because of that. We couldn’t cope with the blanket yesterday. Donegal were wide open at the back in some of their games so you reckon that we won’t see a blanket next weekend which will mean more space for our forwards. Let’s see what damage they can do then. Its still all to play for, so keep the faith folks! Steady on there, Spotlight! Yesterday’s performance bore zero resemblance (at any level) to Longford in 2010. One was a knockout game in the championship and the other was a League game. That’s apples and bananas analysis. Swallow Swoops – that’s an overdue, and welcome, plea for a degree of even-mindedness in the post-match comments from contributors here. Much of what’s said here reflects the support base at large – too optimistic when we play well, too negative when we lose. Ever was it thus. I like your spider’s web analogy for the blanket defence. We set the trap for ourselves perfectly yesterday by giving them such a head start and then, with our short kick-outs and slow build-up, we kept encountering the perfectly set blanket at least fifty yards out. The way we constantly ran into the cover only to get swallowed up and turned over was truly depressing. As I mentioned on the podcast, this naivety contrasted starkly with the intelligent way we played them up in Omagh last year. I’ve no idea why this happened but losing the four key lads certainly didn’t help. As you say, yesterday was in many ways a dry run for us for 13th May so if yesterday’s hiding serves any purpose it’s that it shows us how not to play when faced with this kind of challenge. A valuable lesson, maybe? Hear hear Swallow Swoops. Well said. Also well said Revellino, would welcome the positivity too! Swallow Swoops, you said Tyrone came with a game plan, what was Mayo’s game plan?, most people know how Tyrone set up, ie, the famous blanket. This blanket is not new to Mayo, they know it inside out by now, did Mayo not have any plan to clear this blanket?, after all they needed a result from the game. Mayo beat this blanket a few time before. The Dubs employ a their type of blanket also, I attended the Donegal v Dubs game in Croke a few weeks ago, when Donegal were inside the Dublin 50 yard line attacking, I counted only 2 maybe 3 Dubs playing as forwards, the rest of their players were back defending inside the 50 yard line. The hit on Keegan was to do maximum damage, with one eye on the games to come later in the race for Sam. Maybe Mayo are too nice, should Mayo not have employed such tactics v the Dubs this 2 / 3 years?. I don’t think we could have planned for losing such key players either. Our captain within minutes. Or the bloody seaside! Or waiting for Deegan to do us! All made for headless chickens. Alan Did you ever represent your country at any level even in as you call it a Mickey Mouse Competition. GAA players get one opportunity to do so and thats in the international rules series. Like it or loathe it , it is an opportunity to wear the green jersey and that has to be a major honour. No Dubs in that squad because they couldnt be arsed, would have to travel outside of the Pale and mix with culchies so they decided to stay at home. Only one Galway man because the selectors didnt deem the rest of them good enough and the blanket defence doesnt really work well against the Aussies.And Spotlight I see you reckon Rochford is too conservative. Is that the same Rochford who chose Hennelly over Clarke in the 2016 Replay. Is that the same Rochford who put Aiden full back to mark Donaghey in the semi final v Kerry, was torn to shreds by the media and had the guts to do it again six days later as Mayo beat Kerry for first time in championship for 21 years. If he is a conservative manager I would love to see what a liberal and innovative one would do. I think lee Keegan was caught badly with the shoulder, I was surprised the way he left himself open to that horrible charge, he just buckled up, I hope he recovers soon & gets back into it. Yesterday was total melt down for Mayo with everything that happened. Sunday in Ballybofey will be a huge test for everyone envolved & good luck to them. Galway are playing with a panel of players with competition for places and impact subs to up the tempo, Dublin are playing with fierce competition for places…. Mayo are not. I’m not convinced we haven’t skilful players, whether they have the physical strength and conditioning under their belts is another matter, but they really are not getting opportunities. subbing them with a few minutes to go is nonsense. A drip to division 2 will at least allow management to experiment whatever about the financial losses. It goes without saying we all want Mayo to be competitive in the championship. Posters are only giving concerned opinions of what needs to be done to mantain the drive for Sam. Struggling to make out exactly what youre saying there Alan I might just have to get a new pair of glasses that are not rose tinted. . Didnt ask you did you represent your county Asked about COUNTRY Maybe you played for your county and maybe you were talking to Noel Connelly and if this team is gone as you say so who could blame a few of them for heading off to Australia. Some great men have played International Rules. When did you win that AI medial that these losers have been unable to achieve. Alan – that comment was way out of line, on several levels. You’re on moderation after that and you’ll clearly be staying there too. Ah sure Alan what’s the point. Sure there’s no need to go to Ballybofey then… it’s all over. Are you trying to protect us from reality or just extremely negative… I don’t know. But I’ll believe in these lads till I realise what you already know… Let’s hope there’s a sting in this hornet and we will see that this weekend… what you think about you bring about. I can see Mayo GAA hasn’t developed under age teams but we still have a team that has shown time and again what real passion is like. Mayo88, you’re absolutely right in pointing to the question of Mayo’s game plan. I don’t know if they had one yesterday. There was certainly naivety there and Mayo have not been strong (much as it pains me to see this) since January. (It’s basic though to try to score against these mass-defence teams early, and we missed that, but we’ve been like this before). There are reasons for this – much I really think down to the “hangover” I mentioned above. I am beginning to think that two years through the back door, with a set of ten games last year, does have effects. We were sharp in September but look at the niggles that players picked up from all that running (Lee, Donie V, Seamie…), leading to operations and recovery time, and there must be a need in some quarters for psychological rejuvenation. Perhaps that’s part of the reason that Keith is playing the hurling this season. Prolonged investment in an impassioned endeavour like the Championship each year, and then to come up short, must leave one feeling zapped. Sometimes it’s even more important for the mind to be right than to think about physical fitness. Both are important but the former is very much so, and it doesn’t happen perfectly immediately if one has gone to the well repeatedly and not seen the prize one worked hard for. (Can we all relate to that?) It can definitely come back though. In brief, Mayo88 I think Mayo were naive coming to the table yesterday and I don’t know if they are at the required strength yet this season. They are still coming to strength. I think Newbridge showed signs of green shoots appearing in that we played more fluidly. The other thing is that Tyrone did not have a ten game run last year and allied to that, they dropped out of the competition at a stage earlier than us. That makes them fresher all around, body and mind. Motivation wise, as I mentioned above, they surely want to show everyone that they are a better team than what the narrative suggested on AI semi-final day. And, yes, they are very good. I’d be wary meeting them again in the Championship but we’ll be a different team at that stage of the year, I hope and believe. In conclusion, I think we are still building back up at this particular time. As a point of interest, for those of you better tuned in than I am, are Galway and Waterford in the Hurling encountering any after-effects of Championship in their League runs so far? Regrettably, I’m not fully up to speed on that. I think people’s feelings are valid but I would call for some faith in the team. Let’s hope Ballybofey goes better, and wouldn’t it be good if this made us wiser for 13th May? At least our final league game is not against Dublin or Kerry or Galway or Tyrone. That would have made the job way tougher. The one point of optimism that I toòk from yesterday was how confidently Rochford responded when saying that the good thing about maintaining our Div 1 status is that it is in our own hands. He didn’t appear to be showing any panic. Hoping we see his reasoning for this optimism at the weekend. And if we do get a result next weekend I’m goin celebrating. Waterford have won one outta five. In a relegation play off with Cork. Galway tipping along grand. @Swallow Swoops.. Another thing, is that..so far in 2018… So many teams have came with ultra aggressive game plans when they played Mayo.. Now, Mayo ourselves have one or two blemishes on our own record in 2018,.. But like Shakespeare’s King Lear, we ‘are far more sinned against, than sinning’ … So Far if my memory serves me right…. Galway FBD, 3 Red Cards… Rossies FBD, 1 Red,.. Monaghan, finish with 12,..Between Red and Black… Kerry, by far the worst in my opinion, finish with 12.. 2 Red.. Should have been much more and sooner… Galway, League 1 Red.. Dublin 1Red,..Tyrone 1 straight Red… . I think most teams in Div 1, might have played one or two aggressive match’s…. But there seems to be a belief that other’s can get away with almost anything versus Mayo.. Especially the amount of unwarranted attention that Aiden OShea has had to put up with…Allot has gone unpunished in the past few months… Maybe it has taken a cumulative toll on the team… Last April, we played Donegal in the last fixture of the league… Donegal were on control of the match, but completely lost the plot, with as soon as AOS came on… Eventually, Cormac Reilly, I kid you not sent off a Donegal player for an assault on AOS… Mayo won the match…. Michael Murphy seems to have a problem with Mayo…. He succeeded in getting Kevin Keane in the 2016 quarter finals.. I hope it’s a football match next Sunday! I think we should go back to Robbie in goal the next day his kickouts were really good against Kildare plus we will need him to nail any long range frees with Cillian gone , Clarkies short kickouts are putting us under serious pressure.Surely Ger McDonagh has to be number 3 the next day not going to say why on here but the whole county is on about it would also like to see Shane Nally in for Stephen Coen Coens foot passing was really poor yesterday he was also really loose on Mattie Donnelly all through the match. Maybe Dougie should get the nod for replacing Cillian hes the best free taker in the county Loftus scuffed a few chances plus a bad penalty miss. I suppose Paddy Durcan Is the obvious switch for Lee Keegan out injured. Not many other changes really would like to know if Keith Higgins and Chris Barrett could feature cause we need them back asap. Any word on Ciaran Treacy last time I heard anything on hear he was injured , best player in the FBD for Mayo and still hasn’t got any game time. 6.Shane Nally deserves a start we bet Monaghan with him playing at 6. Feel Loftus plays better as sub when game opens up. I’m taking a guess that Mayo in very hard training with a goal of May but that’s only a guess. That said we have struggled against the blanket apart from once v Tyrone in Croker when Alan Dillon was deployed to confuse them with his vision and passing and even then we just about beat them. Dublin unravelled the blanket completely though it mightn’t have happened had Con O’ Callaghan not scored that brilliant goal, either way they had a great game plan that day. To beat Galway we need a plan for the blanket. We were starting to make inroads drawing them out in Salthill last year when Keith got sent off but this is now a significantly better Galway team. We probably only have 1 player who can do what Alan did that day, Kevin McLoughlin and in time Fergal Boland or Conor Loftus may have it but not yet. So horses for courses, Kevin as sweeper / playmaker against these cac defenses. Either that or the Dublin template of running them ragged with overlaps in all directions. As for Donegal it’s a cup game, do or die in the league, a lot of it down to pride now. @Shuffly Deck, ..That was Mayo’s luckiest win of all time… Neil Morgan missed virtually every free for Tyrone on the Day…. The ‘Don’t foul’ analysis of the game… Came to the conclusion that, well over 95%. of the the match’s played gun iven the stats for that game… Mayo should lose by 8.Points… We can hold it up as a tactical masterclass, which it most definitely wasn’t… It was a matter of Tyrone blowing it… And seriously flawed tactics by Mickey Harte… Playing Joe McMahon who didn’t actually do anything.. He then brought on another player presumably to mark Alan Dillon in the second half.. But Alan Dillon had been substituted for the second half..Winning that was talking mixture of some good players, some good decisions.. And Tyrone blowing a match they should be have won easily themselves… But no Masterclass by anyone!